On an annual basis, foreclosure filings fell last month. As compared to August 2010, last month’s foreclosure filings dropped 33 percent. “Foreclosure filing” is a catch-all term, comprising default notices; scheduled auctions; and bank repossessions. 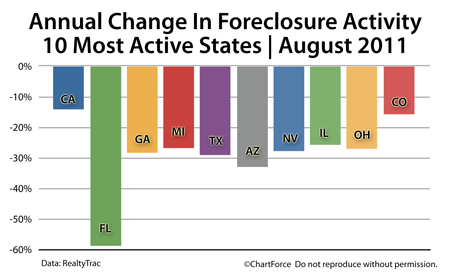 The study was published by foreclosure-tracking firm RealtyTrac and this month’s report reveals a slowing rate of foreclosure within each of the Top 10 most foreclosure-heavy states. All news is not good, however. On a monthly basis, foreclosure filings spiked, led by a surge in default notices. Default notices made their biggest one-month jump since August 2007 on the way to a 9-month high last month. Default notices are the first step in the foreclosure process so this jump may foreshadow a large number of bank repossessions as foreclosures “make their way through the process“. It’s also noteworthy that just 6 states housed half of the nation’s bank repossessions last month. As a home buyer in Brentwood , foreclosures can save you money. The National Association of REALTORS® reports that distressed homes sell with typical discounts of 20 percent versus comparable, non-distressed homes. However, buying a home from a bank is a different process from buying a home from a “person”. Contract negotiations are different and it can take months to finally close on a foreclosed home. If you’re buying a foreclosed, therefore, enlist the help of a professional real estate agent. Real estate agents can help you navigate the sometimes-complicated world of foreclosures, and help you come out ahead.